We recycle almost everything, and shoulder pads are ready-made padded shapes for 3-dimensional crafts. We've shown you how to make a butterfly, and promised we'd find the angel -- but we didn't -- so we started over and wrote out new instructions. You can see what we did with a few folds and a couple of seams. Sewing thread to match shoulder pads and 16 inch hankie or fabric square. 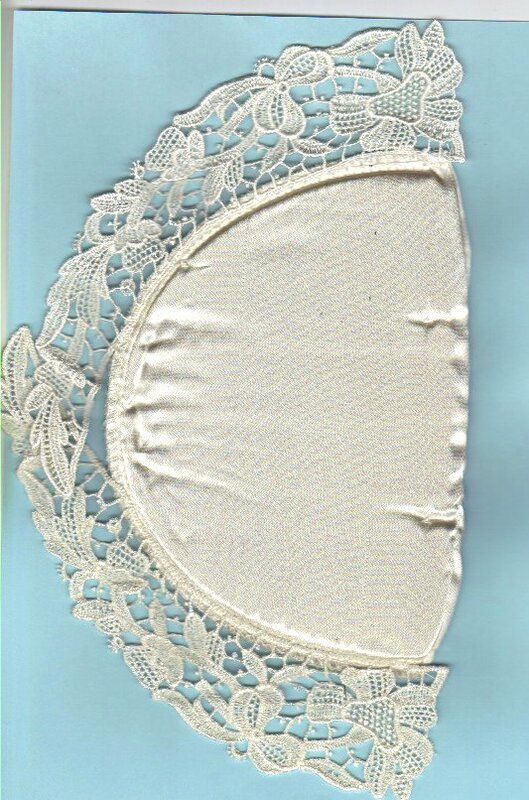 Add lace trim all the way around one shoulder pad. Stitch around the 16-inch square of fabric so the edge is finished, unless you plan to use it for a centerpiece or mantel with the skirt covered. You can add lace all the way around the fabric square if you're planning to use it for a tree topper. Fold the fabric square diagonally in a triangle with the stitched side inside. Place the Styrofoam ball or wooden ball inside the fabric in the center. Use a twist tie or thread to secure the ball in the center. 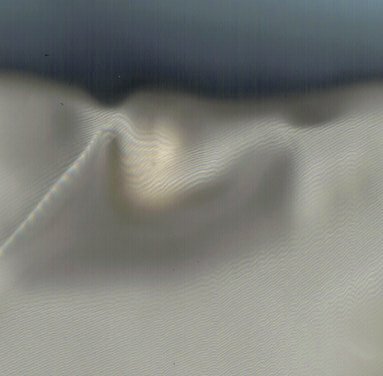 Create a halo with ribbon. You can place the ribbon around the "head" like we did here or if you prefer, wrap the ribbon around a twist tie. Shape it like an eyelet screw or a lollipop, a circle with a stick. Push the stick end to the back and hook it on the twist tie at the neck. Place the shoulder pad without the lace around the "shoulders" below the twist tie and stitch in place from the back. 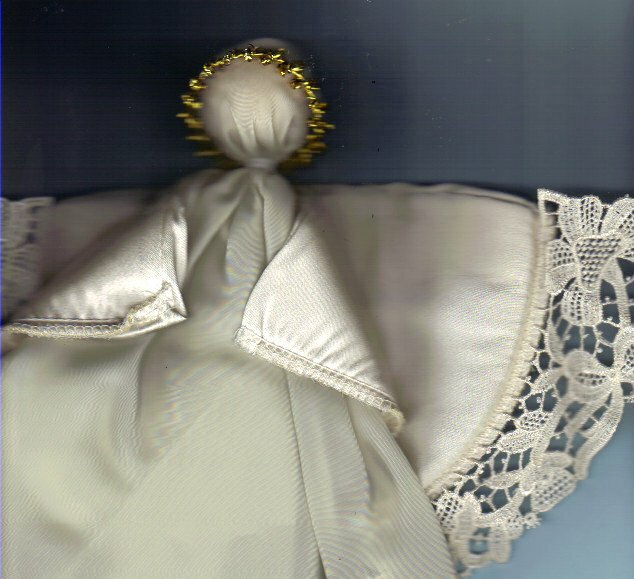 If you want to have the inside of the angel's gown open to place over a tree or other item, stitch the shoulder pad in the center to the center of the back of the gown. 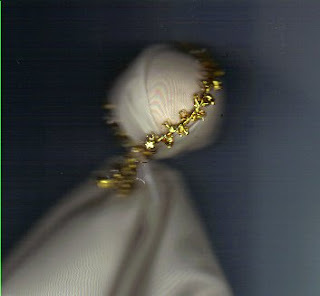 Wrap it around the front of the gown and stitch the corners of the shoulder pad together. 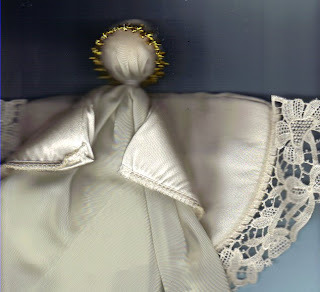 Attach the shoulder pad with lace as wings to the back in the same location as you stitched the "cape" to the gown. Create a face on your angel if you choose. Use fabric paints for cheeks, lips and eyes. You can use this angel for a tree topper, centerpiece or mantel, or let her hang from a corner display. 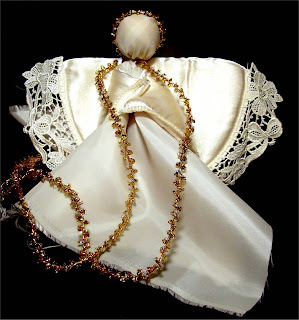 You can also make small angels for tree ornaments with single shoulder pads. 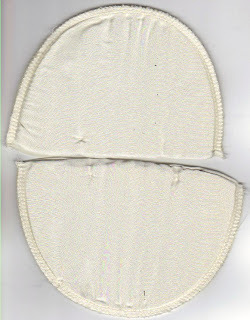 Zigzag stitch two semicircles on one shoulder pad. 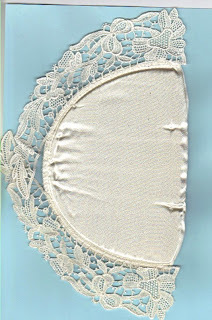 Cut the semicircles from the shoulder pad and follow directions from the top here to add lace to one. 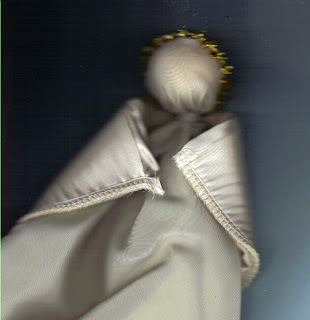 Use a 1/2 inch Styrofoam ball for the head and a 6 to 8 inch square for the gown.